Is car polish important in maintaining the good looks of my car? Yes, car polish is definitely important in order to keep your car like brand new for a really long time. How to polish my car correctly? First step: get the best random orbital polisher. Random orbital polishers, also called dual-action polishers, are the EASIEST and SAFEST electric polishers. They don’t apply torque to the surface, and assures the buffer never concentrates its energy in one spot, unlike regular rotary polishers which can easily apply too much pressure to the paint and burn right through it if you are not skilled, requiring a new paint job. Random orbital polishers are lightweight and easy to control on both horizontal panels and vertical panels. 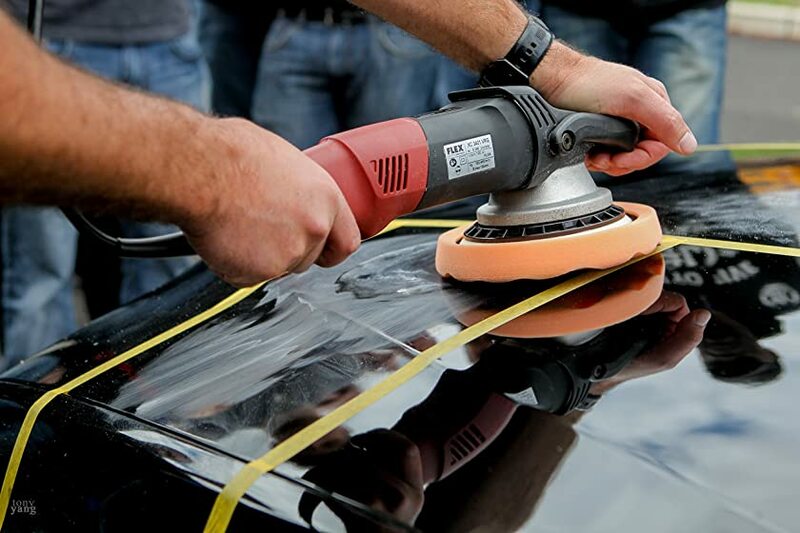 You can use them to remove swirls, polish paint to a high gloss, apply a wax or paint sealant and even use them to remove the wax or paint sealant after it has dried. The free rotating spindle assemblies make these polishers very safe for regular polishing and waxing. Among all the best random orbital polishers that we suggest to you, the Meguiar’s MT300 Pro Power DA Polisher is the one that we love most. This polisher is very easy to use, has an ergonomic and great balanced design, a smooth operation, and on top of that, it comes with a great price compared to other high-quality polishers on the market. Even you’re a beginner, with the MT300 you can polish your car like a professional detailer and keep your car looking fantastic every day. 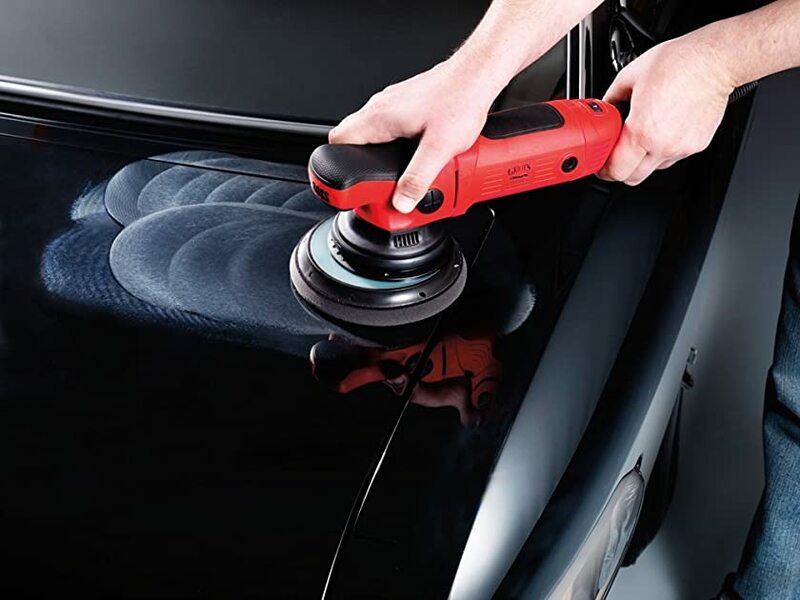 The Meguiars MT300 removes imperfections that were formerly only removable by a rotary polisher, but it maintains the user-friendly features of a random orbital polisher. It features a 500-watt polishing power which delivers the power and torque needed and demanded by enthusiasts and professionals alike. It uses the same gentle dual action motion and 8mm throw that enthusiasts and professional detailers know and trust even on the most sensitive or durable paint finishes. The best part of this dual-action random orbital polisher is its compact and ergonomic design. The design that makes even a young girl can polish a car easily and get incredible results. At 5.4 pounds, the MT300 is heavy enough to be effective but light enough to be comfortable, your arms won’t get tired after a couple hours of buff work. Overall, we believe the Meguiars MT300 is one of the best random orbital polishers you can buy. You can use it for any type of paint in any condition and your car will regain its like-new shine. TORQ Tool Company makes some of the best car polishers that everyone enjoys and affords. The TORQ BUF501X 10FX Random Orbital Polisher Kit has an affordable price but very high quality, it includes everything you need to polish paint, remove swirls and scratches, spread wax and sealant, and much more. If you don’t have much time for shopping and researching, this kit is probably the best option to buy. 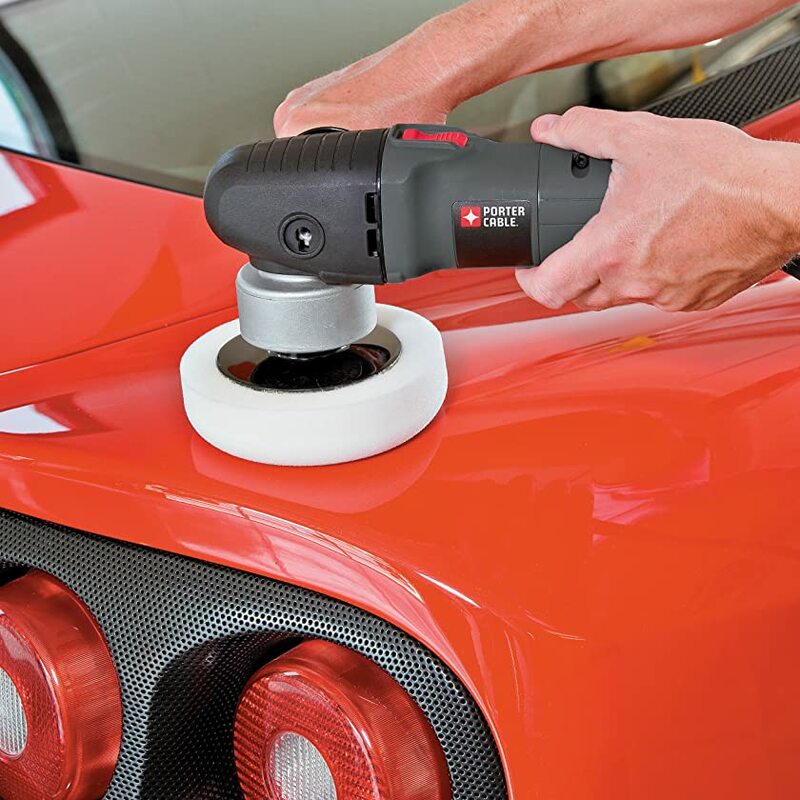 The TORQ 10FX Random Orbital Polisher is a professional-grade dual-action car polisher that enables users of all skill levels to achieve a flawless finish in their garage. It features a 700-watt motor which is more powerful than the Meguiar’s MT300. Its digital speed controls transmit every bit of power from the motor at 6 distinct speed settings for precise control on sensitive or intense detailing jobs. Smooth startup and power engagement ensures better control and reduces product sling and accidents. One of the best parts of the TORQ 10FX, like some other best random orbital polishers, is the user-friendly design. Onboard digital controls and display deliver ideal comfort, ease of use, precision, accuracy, and improved safety. The streamlined digital display and power controls are ergonomically integrated directly above the hand grip, all within thumb’s reach. Plus, unlike many cheap random orbital polishers on the market, the power controls of the TORQ 10FX are extremely intuitive, making it comfortable and easy to control speeds without ever taking your hands off the machine or eyes off the paint. The intuitive design keeps your eyes and attention on the job for improved safety and faster results. The streamlined and ergonomic design of the TORQ 10FX deliver the most comfortable polishing experience possible to the user. There are a lot of things going for the TORQ BUF501X 10FX Random Orbital Polisher. It’s one of the best-detailing tools designed for you and will cut your polishing time in half. We’ll tell you why the Rupes LHR15 Mark II BigFoot Random Orbital Polisher is rated as one of the best random orbital polishers for professional detailers. Because it offers the smoothest and most efficient operation we’ve ever seen. 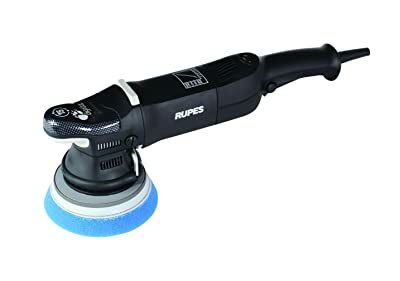 The amazing Italian design of the Rupes LHR15 Mark II delivers the most comfortable polishing experience possible to the user. That’s probably why it’s one of the most expensive random orbital polishers on the market. The Rupes LHR15 Mark II Big Foot is built with everything that made the original Rupes LHR 15ES. With improvements made to both the body, chassis, and motor, the Rupes LHR15 Mark II provides 30% more efficient than the original machines, making correcting your paint smoother than ever before. With a unique 15mm throw, it covers more surface area than most typical orbital polishers which have a throw between 4 and 8mm. A bigger throw also gives this polisher the ability to run smoother and correct defects faster than a conventional dual action polisher. Also new on the LHR15 Mark II are rubber inserts inside the tool that improves the handling and provide a better level of comfortability while in use. The new rubber tool rest on top of the machine allows you to set the polisher down pad-up and not contaminate either your pad or the paint you’re working on. Overall, if you’re looking for not only the best random orbital polisher on the market but a professional-grade polishing tool that is built to last, then you can’t go wrong with the Rupes LHR15 Mark II Big Foot. 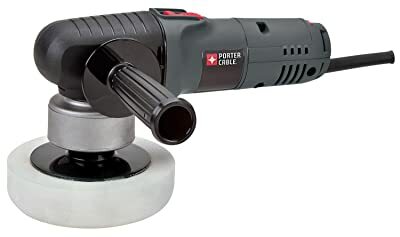 The PORTER-CABLE 7424XP 6-In Variable-Speed Random Orbit Polisher is one of the best random orbital polishers for beginners. More than half of the people that we know are using it to polish their cars. That because this polisher is very safe and easy to use, it’s also much less expensive than most other models of the same quality. The PORTER-CABLE 7424XP features a 4.5 Amp motor and electronic variable-speed dial that operates at 2500-6800 OPM. It’s capable of working at faster speeds than the original 7424, which enables to remove more paint imperfections. In addition, it has an improved switch design for greater durability. The body of the polisher has been redesigned with improved ergonomics to give the operator more comfort and control than the original model. However, even though the body has been improved to be easier to use, the PORTER-CABLE 7424XP still requires two hands (one positioned on the body, the other on the auxiliary handle) to guide and hold the tool to the surface. It is lightweight (only 6 pounds) but doesn’t perfectly fit in the palm of the hand like the Rupes LHR15 Mark II Big Foot. By far, the Griot’s Garage 6″ Dual Action Random Orbital Polisher is the best random orbital polisher from Griots Garage. It has established a reputation among detailers and enthusiasts for having the ability to remove just about any paint imperfection imaginable including water spots, swirls, oxidation and even light scratches! 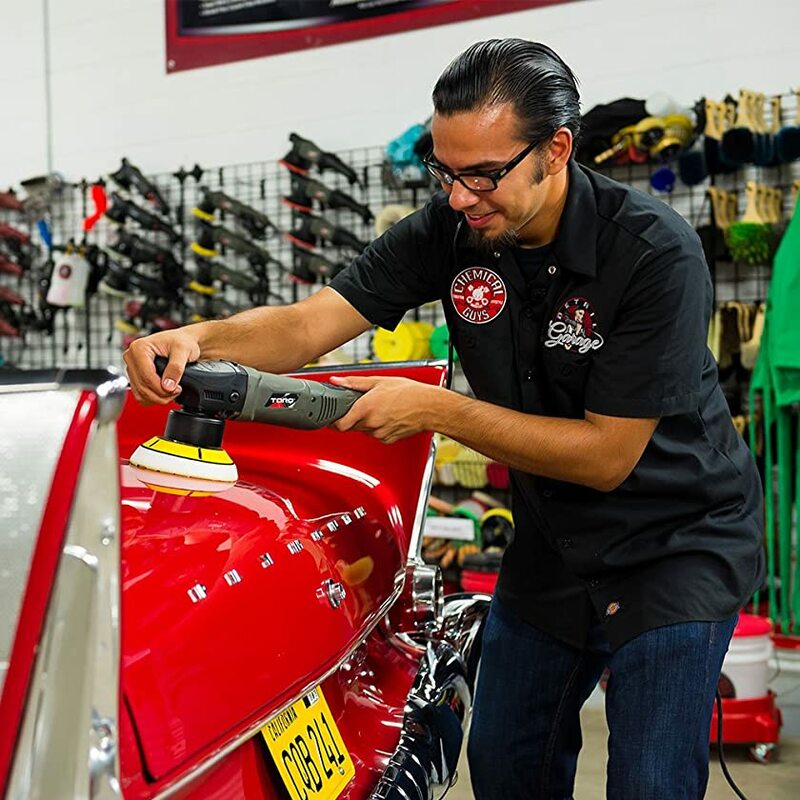 The Griot’s Garage 6″ is engineered with the same powerful 7-amp, 850-watt motor that eliminates paint defects with ease. It features a strong 5/16’ stroke and six variable speeds, from 2800 to 6800 OPM (oscillations per minute). Any standard dual-action backing plate will fit so you can use your favorite polishing pad selections and sizes. This is the 3rd generation Griot’s Garage polisher which is redesigned for more comfort. A new rubberized adjustable hand grip increases user comfort and helps isolate polishing vibration. The new ergonomically designed exterior features molded hand and finger grips for improved comfort. A domed and rubberized palm grip allows for precise control during aggressive polishing. The speed selector dial and power switch have been moved to more convenient locations allow you to focus more on the task at hand – polishing paint! 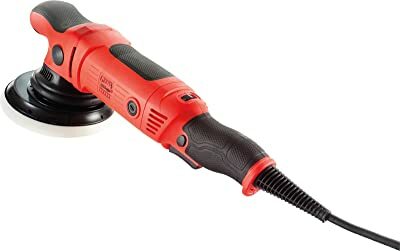 Overall, we would recommend you buy this random orbital polisher, and also recommend the extra-long 25 ft cord. 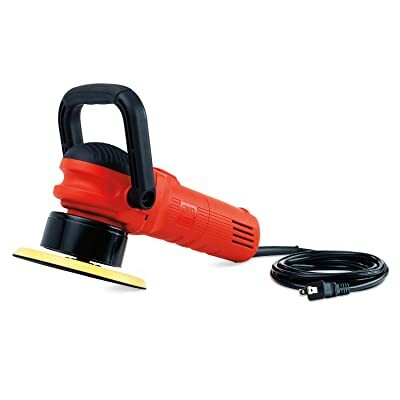 The longer cord is more convenient than an extension cord and it is gauged to deliver maximum power to the polisher for safe, efficient operation. The Flex XC 3401 VRG Dual-Action Orbital Polisher is one of the best random orbital polishers of Flex Power Tools – a German company which was founded in 1922. The company offers some of the top-of-the-line polishers for customers around the world. The Flex XC3401VRG delivers serious power with the convenient variable speed trigger. Meaning at full squeeze you are running at the maximum speed setting you choose. However, unlike other random orbital polishers, if you let off the trigger, the polisher slows down. There is also a convenient lock feature that you can lock in your maximum speed setting without using the trigger. Your speed setting is set by a dial that reads 1 – 6. The control you have doesn’t stop with the speed, but the ergonomics as well. The Flex XC3401VRG also comes with many other technological advancements that make it one of the premier buffers on the market. It uses seven-fold microprocessor electronics: with consistent speed control by tachometer generator, soft start, accelerator trigger switch, restart protection after power interruption, overload protection, temperature monitoring, and speed selection. The oscillating motion moves the buffer precisely 8mm during one orbit. The handle is removable and easy to hold so you can detail for hours with no problems. When you use the Flex XC3401VRG to polish your car you will find that this polisher is very simple to use and gets the job done fast. It’s by far one of the best random orbital polishers for professional detailers and beginners as well. But like the Rupes Mark II BigFoot, this is one of the most expensive random orbital/dual action polishers on the market. The Griot’s Garage BG21 THE BOSS Long-Throw Orbital Polisher is a high-powered dual action orbital polisher designed to make quick work of paint defect removal. It has a 21mm orbit, which represents a 162% increase in orbit throw compared to a conventional orbital’s 8mm throw. A pad that rotates in a larger orbit does more work per pass, your liquids are more effective, and you get results that surpass expectation. Manufactured with a 900-watt motor, 7.5 amp motor, THE BOSS G21 Long-Throw Orbital Polisher has no trouble removing different types of swirls and paint defects. It’s also included an anti-fatigue feature in the form of a Trigger Lock Button. This feature allows the power trigger to be held in place while polishing the paint. You will find this is a great feature particularly when you have to work for an extended amount of time! Overall, the Griot’s Garage BG21 THE BOSS is certainly one of the best random orbital polishers available. But the difference between it and the #1 Meguiar’s MT300 Pro Power DA Polisher may not seem significant, we think the Meguiar’s is the better choice for the price. What’s the Best Generator For Your RV?